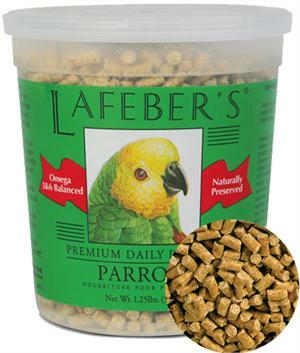 Parrots & Company of Stamford, CT > Bird Food > Lafeber Bird Food > Lafeber's Pellets - Parrots, Greys, Lg. Conues, etc. Good health and a long life begin with proper nutrition and Lafeber's Premium Daily Diets are formulated to provide exactly that. Lafeber Parrot Pellets are a high quality blend of natural ingredients like ground non-GMO corn and soybean meal. Both grains are literally grown outside Lafeber Company's front door. In addition, whole egg, the world's most digestive form of protein, is added. Essential vitamins, minerals and amino acids (all necessary for strong bones and brilliant feathers) are added to the grains and mixed. Watch your feathered friend shine with the excellent nutrition found in Lafeber's pelleted bird food.